Project engineer Steffen Kronberg and ITP Pergande CEO Mirko Peglow (left to right) see the digital twin light up in the exact place where the fault is located in the real plant. Situated in Weißandt-Gölzau near Halle (Saale) are the enormous and highly complex production facilities of IPT Pergande GmbH. IPT stands for “Innovative Particle Technology”. Using the latest in fluidised bed technology, granulates are produced in these facilities for the chemicals industry. Faultless plant operation is crucial for maintaining efficient production and the high quality of the granulates. IPT belongs to the Pergande Group, a world leading enterprise in the field of particle and granulation technology. In addition to operating its own production facilities, the group builds and sells turnkey fluid bed granulation plants. “Our customers are from all over the world,” IPT Pergande CEO Mirko Peglow says, naming a construction project for South America as an example. The fluid bed granulation plant will produce around 6,000 tonnes of plant protection product per annum. It consists of around 400 aggregates and machines and has some 800 test points. “The Industry 4.0 age is arming us with digital tools that allow us to develop solutions for easier maintenance of such plants,” Peglow says. The word “innovative” in the company’s name says it all. Project engineer Steffen Kronberg heads the Technikum, the pilot plant station where many future-oriented projects have already been launched – in most cases together with partners from industry and science. This was the case with an electronic assistance system, for example, the first prototype of which was presented at Hannover MESSE 2017. The company will be presenting its more advanced prototype No. 2 at the world forum and leading show for the process industries ACHEMA 2018 in Frankfurt am Main. “The basis for the assistance system is a virtual 3D representation of the real plant – the digital twin,” Steffen Kronberg explains. Just as a plant operator gains professional experience, so too does the digital assistance system, in that the engineers feed it with knowledge, including their continual discoveries. In the field, both work hand-in-hand, in the truest sense of the words. Kronberg holds a tablet in his hands, secured by a wrist strap. The real production plant indicates a simulated fault with red flashing and an acoustic warning signal. Now it is up to the technician to start locating and troubleshooting the fault. “The manual for such a huge plant is about 30,000 pages thick,” Steffen Kronberg says wryly, pointing at the tablet. In the virtual plant, a blue light flashes where a filter is installed. 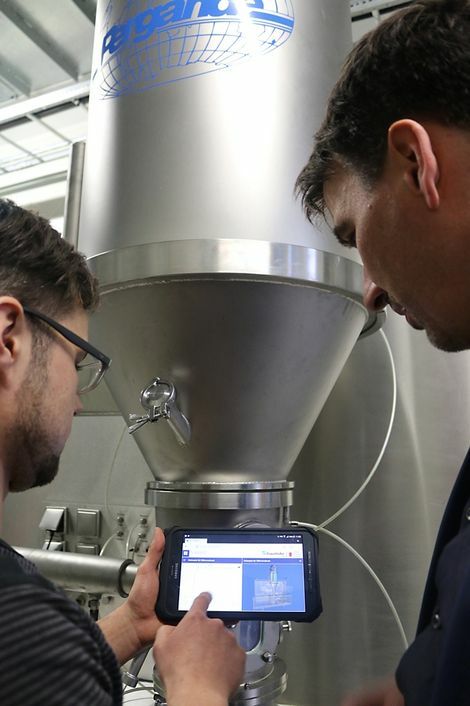 Kronberg uses the tablet to read the filter’s QR code and obtains all the information he needs – right up to interactive recommendations for action to remedy the fault. Digital instructions lead him step-by-step through the repairs. More than 3,500 men and women have enrolled in the IT-specific study courses at the University of Saxony-Anhalt. They are researching and developing the tools of the future: digital information and communication technologies. Out of the 2,075 IKT companies in Saxony-Anhalt, more than half are specialised in software development and IT services. The IKT industry of Saxony-Anhalt has long since outgrown niche status, with nearly 16,000 employees at present. Its customers are automotive suppliers, energy providers, machine builders and public administrations – throughout all of Europe. “The way we see it, the potentials of digitalisation also exist, above all, in the preservation and use of knowledge generated in the company as valuable capital,” says Lars Bendler, CEO of Lintra Solutions GmbH in Magdeburg. In 2002, he and two fellow entrepreneurs founded this company, whose name stands for “Leistung, Innovation und Transparenz” (Performance, Innovation and Transparency). Together with their customers these IT service providers develop mainly enterprise communication platforms. Lintra products can be used for comprehensive management of documents and projects, establishing smart Intranet portals, and expanding enterprise social networks. Lintra makes use of SharePoint and Office 365. All authorised people can access these “data clouds” from anywhere, in order to share and jointly use the company knowledge base. “That gives the company a major competitive edge,” Lars Bendler says. The Institute for Automation and Communication ifak e.V. in Magdeburg is also on the front lines of the fourth industrial revolution, and is involved in the development of processes that digitally network things such as plant equipment, IT systems and business models to promote integrated communication – free of misunderstandings and lost time. In the joint project “autoAPSint”, ifak and regional IT companies have developed a solution that allows real-time communication at all levels from device and control technology to administration. In the project ENTOC, together with major automakers, the project partners are accelerating the advancement of virtual production lines. “Predictive 3D simulation of all processes shortens the retooling times on production lines when changing vehicle types. It also allows errors in the control or plant components to be corrected before the real plant goes into operation,” says Mario Thron, a research assistant at ifak.